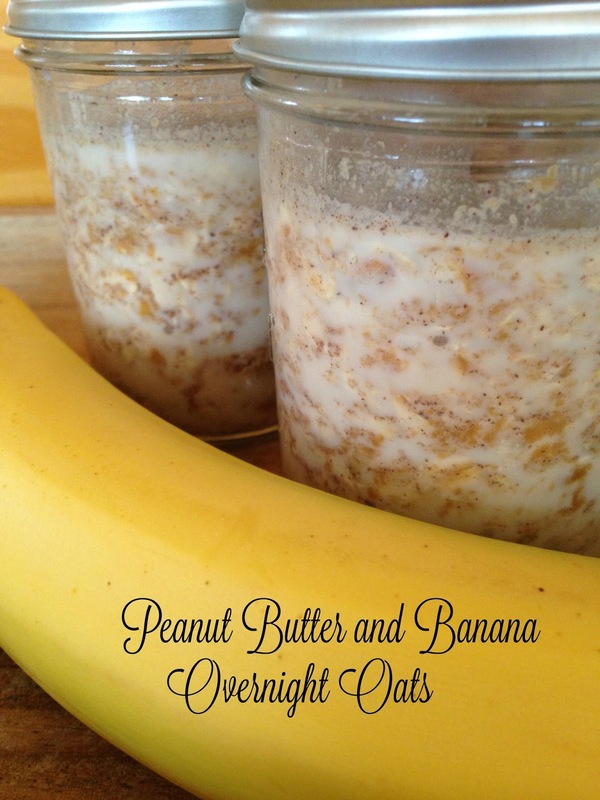 What are Overnight Oats in a Jar? A delicious ‘grab n’ go’ breakfast. Breakfast is the most important meal of the day, right? If your like me and skip breakfast or order your breakfast at the drive through on your way to work…Shame on you and shame on me too. Oh, I eat my obligatory bowl of bran flakes every morning (now that I’m considered a “senior”) sometimes even with a sliced banana on top, but let’s face it, that can get really boring. 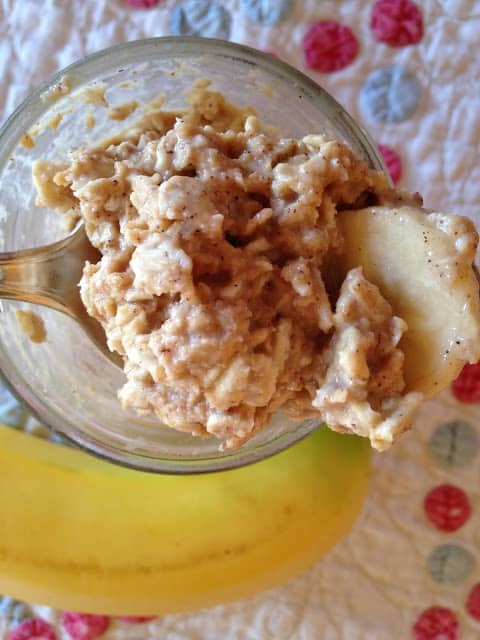 Peanut Butter and Banana Overnight Oats is far from boring! With this easy recipe for overnight oats in a jar, you’ll never skip breakfast again. 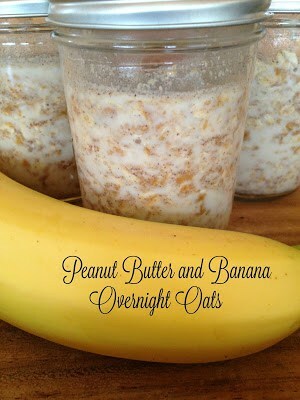 In fact, you’ll look forward to getting up in the morning just so you can get your overnight oats in a jar! No more paying way too much for that lukewarm egg sandwich and those cold, greasy round potato things. Even though once in awhile that lukewarm egg sandwich and those greasy potato rounds taste pretty darn good. It’s ok to indulge one in awhile. 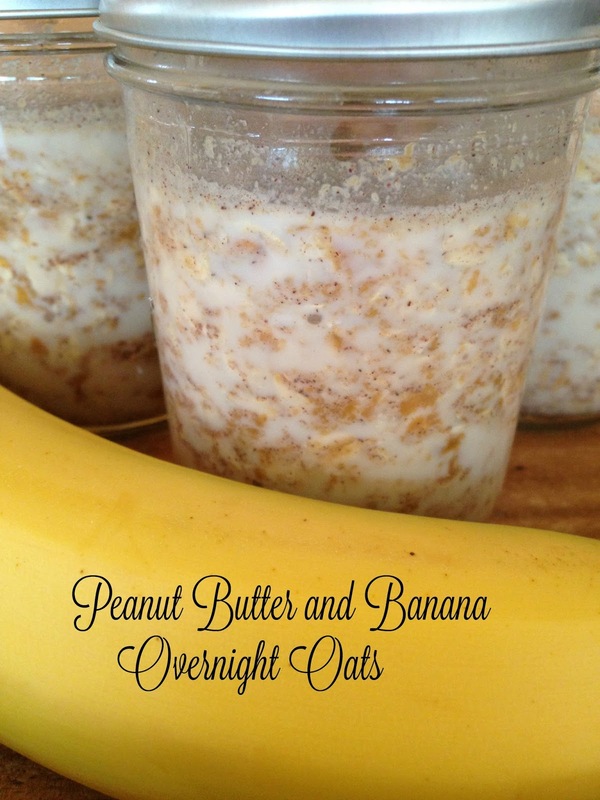 When I first heard or saw the onslaught of overnight breakfast in a jar recipes and images on Pinterest, I was very curious. I mean, how in the world could that concoction possibly taste good? What are/is Overnight Oats in a Jar? The principle behind overnight oats in a jar is a simple one…you add oats to a glass jar or other covered container, add some kind of milk or liquid, some your favorite toppings and pop the jar into the refrigerator overnight. The next morning your delicious breakfast will be waiting for you. You will never have to miss breakfast again, ever. Here are a few pointers to keep in mind when making overnight oatmeal: Most of the recipes for overnight oats are fast, easy and affordable. Roughly 5-10 minutes of prep time. The “add ins” are endless, you can use anything you like. The oats will last 2-3 days in the refrigerator, this gives you 3 mornings of breakfast. 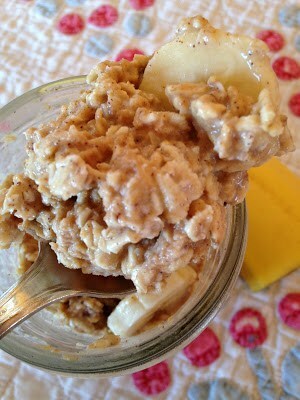 You can eat overnight oats directly from the refrigerator or heated in the microwave 1-2 minutes on high. You can use any jar with a tight fitting lid. Empty, cleaned pickle, jam, or canning jars work great. Guideline Recipe for Overnight Oats in a Jar (serves one) Recipe follows. In a medium bowl, combine all ingredients except bananas. Ladle 4 equal servings into jar. Cover and refrigerate overnight. Warm in the microwave for 45 seconds up to 1 minute, then top with 1/2 a banana, sliced, on each serving. milk, soy milk, almond milk, coconut milk, etc. Fill glass jar 1/2 full with oats. Add 1 teaspoon chia seeds, optional. Fill glass with liquid until oats are well coated, such as: skim milk, coconut milk, almond milk, rice milk, orange juice.